Dramatic Rymer home run lets KCKCC nip No. 9 Highland, 10-9 – Welcome to Wyandotte Daily! 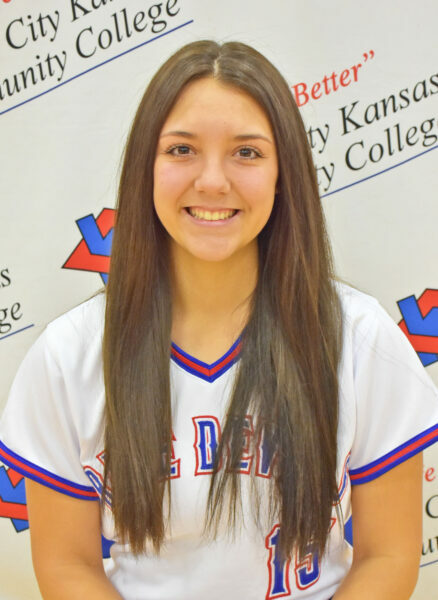 Freshman Alexis Rymer’s first collegiate home run was one she’ll never forget – a dramatic 3-run shot in the bottom of the sixth inning that rallied Kansas City Kansas Community College to a 10-9 win over Highland Thursday. Ranked No. 9 in the latest NJCAA DII softball rankings, Highland (11-5) ended the Blue Devils’ nine-game winning streak with a 10-2 win in the opening game and the Scotties led 6-0 before the Blue Devils erupted for seven runs in the bottom of the fourth inning in the second game. Highland went back ahead with a run In the fifth and two in the sixth. Trailing 9-7 in the sixth, Devin Purcell and Shay Grosstephan started the inning with singles and after a pop-out, Rymer belted a 3-run home run that proved to be a game-winner after the Blue Devils survived a harrowing seventh inning. “We walked the first hitter (Alexis Hodapp) intentionally,” KCKCC coach Lana Ross said. Grosstephan got the first out on a ground ball to Hannah Redick at short but then gave up a walk. A line drive to Redick got the second out before a passed ball put runners on second and third before Grosstephan induced Sirena Salazar to hit a game-ending fly ball to Rymer in right. Grosstephan went the distance for the win, allowing 11 hits and nine runs, three of which were unearned. She struck out one and walked three. Mackenzie Pinkerton doubled and singled twice, Redick doubled and singled and Grosstephen singled twice. Rymer had a two-run single and Redick, Purcell, Grosstephan, Pinkerton, Paige Froshey and Britney Smith drove in runs in the 7-run fourth inning. Highland took a 3-0 lead in the first inning of the opening game but led only 4-2 before scoring three runs in both the fifth and sixth innings. Rymer and Purcell each had two hits for KCKCC with Purcell and Kaylee Arnzen driving in the two runs in the 10-2 loss. Pinkerton took the loss, allowing 11 hits and 10 runs, three of which were unearned. She struck out three and walked two. Originally scheduled for a doubleheader at Southeastern Iowa Saturday, that twin bill has been moved back to next Wednesday at 1 and 3 p.m.